What to do with that leftover Turkey? 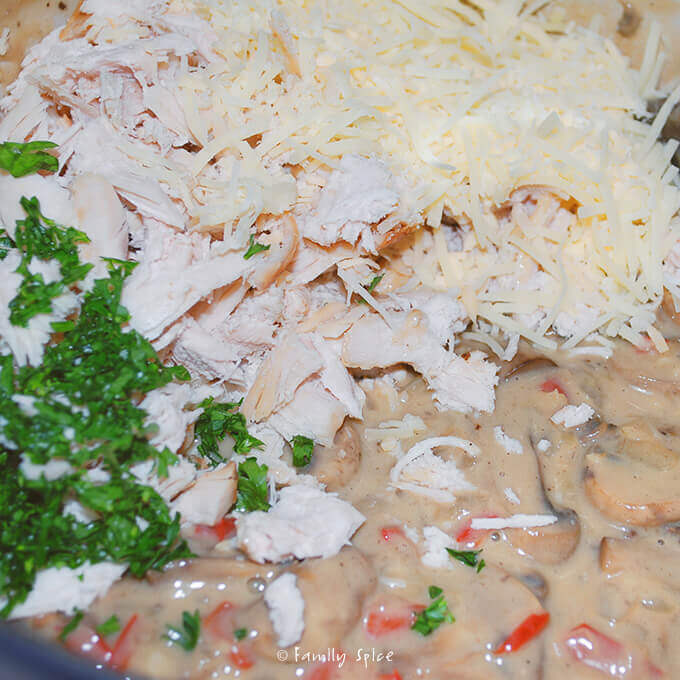 This Creamy Turkey Tetrazzini is just what you need! Thanksgiving was fabulous this year, since I didn’t have to cook and I was able to indulge on all those wonderful Thanksgiving flavors. When I make turkey and the fixings, I always make sure I have plenty of leftovers. I love everything so much that I don’t mind eating three days later! But, I do know not everyone is like that, for example the rest of my family! 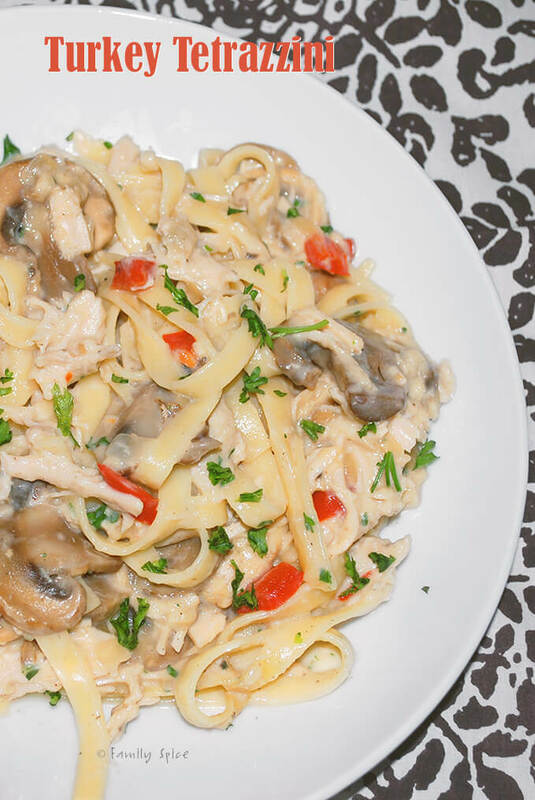 So if you have some leftover turkey that you don’t know what to do with, then here’s one great recipe: Creamy Turkey Tetrazzini. Don’t let this fancy name scare you. It’s actually very easy to make. You start with butter (yum!) 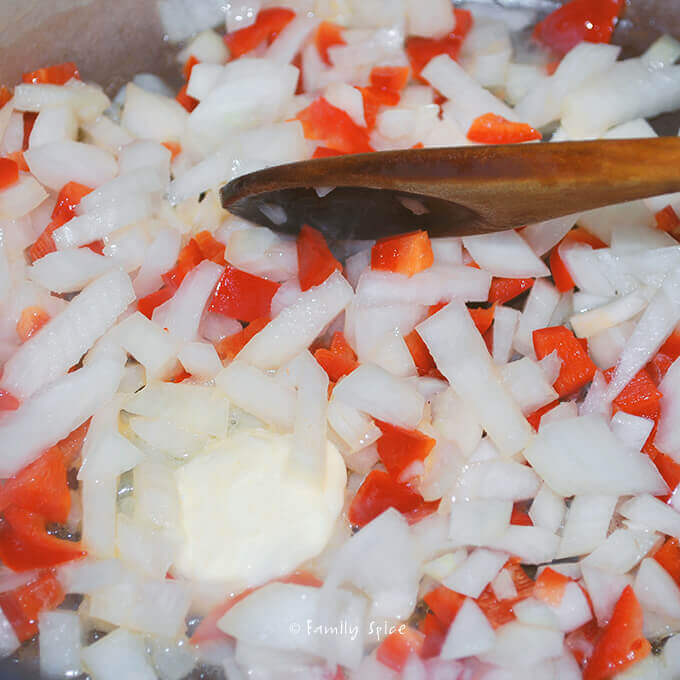 and sauté your onions and red bell peppers. Mix in garlic, mushrooms, spices and flour to make some roux and delicious brown bits. Deglaze your pan with white wine and turkey stock, and let the sauce thicken a bit. Next add your half-and-half and bring the sauce to a boil. Reduce heat until sauce is nice and thick, about 15 minutes. You want it thick enough to coat the back of a spoon. Once thick, add your grated parmesan, parsley and shredded turkey. 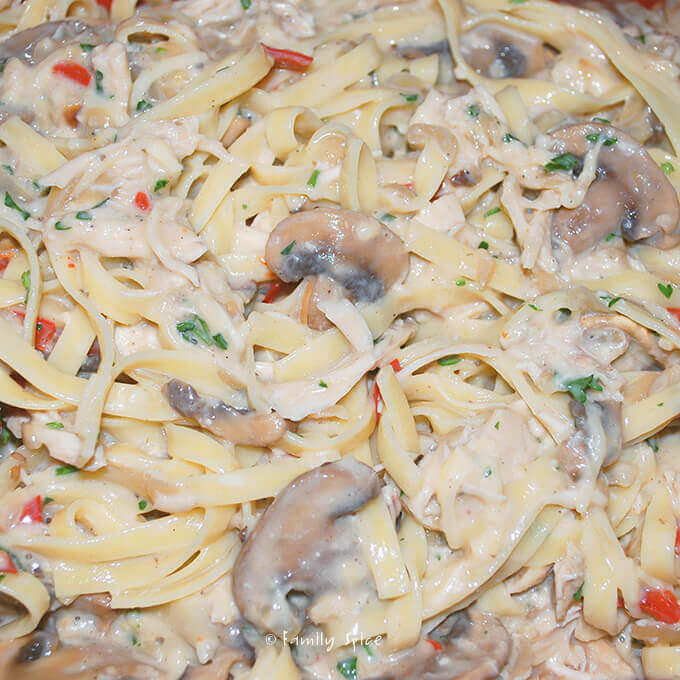 Once all the cheese is melted and the sauce is smooth and creamy, serve it over fettuccine. No one will notice that you used that leftover Thanksgiving turkey! What to do with that leftover Turkey? 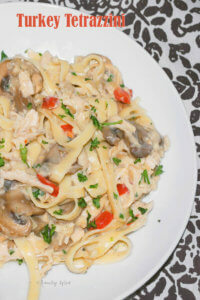 This Creamy Turkey Tetrazzini is easy to whip up and a delicious way to use up that turkey. 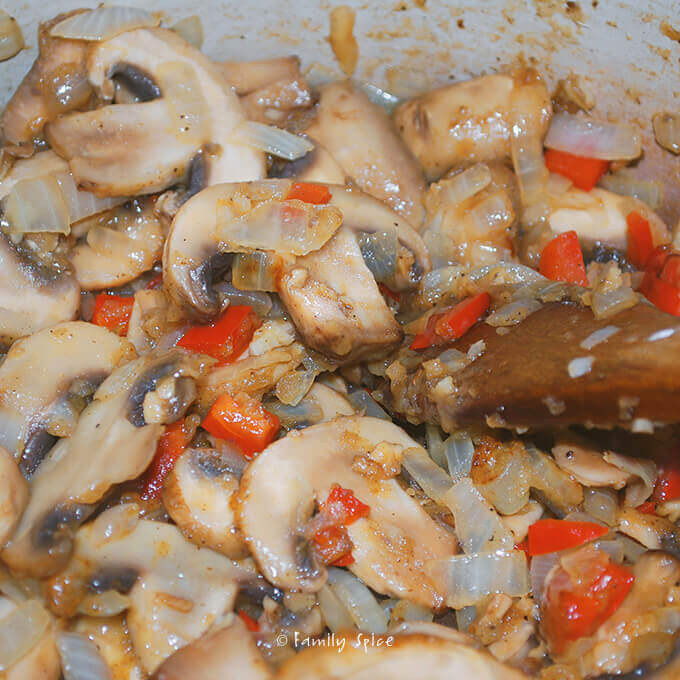 Cook until mushrooms soften and release their juices, about 5 minutes. 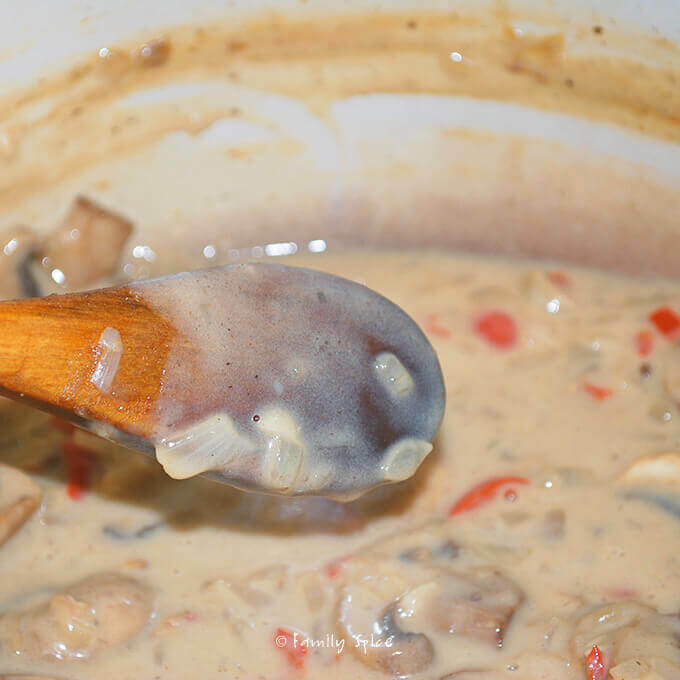 Continue cooking and stirring until smooth and sauce begins to thicken, about 2 minutes. 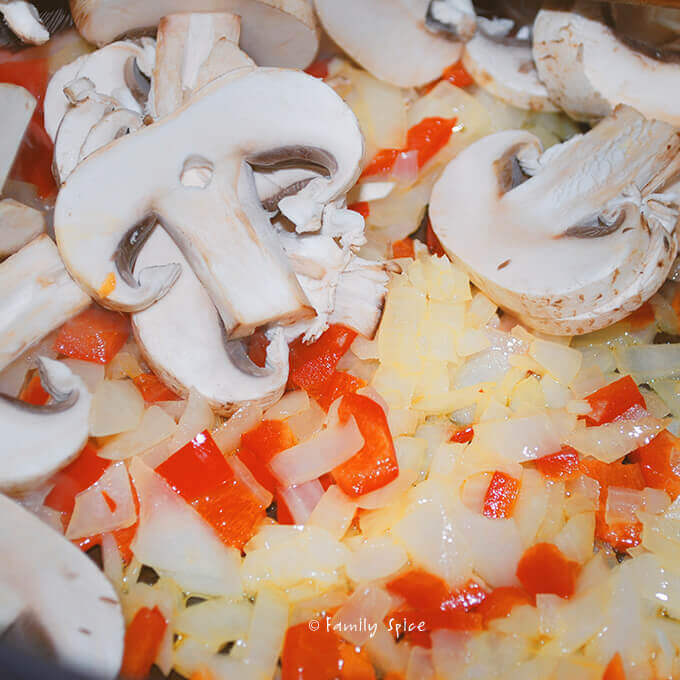 Reduce the heat to medium-low and simmer, stirring occasionally, until the sauce is thick enough to coat the back of a spoon, about 15 to 20 minutes. 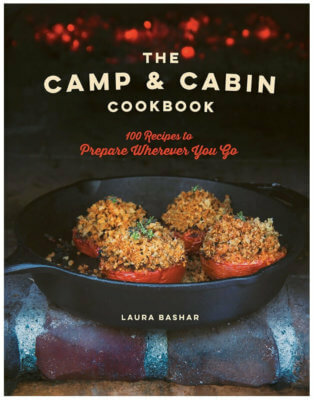 Cooking Tips: Great with chicken and pork, too!